Small countryside homes nearby the city - favorite places for ukrainians to spend their holidays or weekend. Really small dacha, 70 km from Kiev. In the Ukraine most Kiev inhabitants like to spend their extra time and holidays on Dachas. 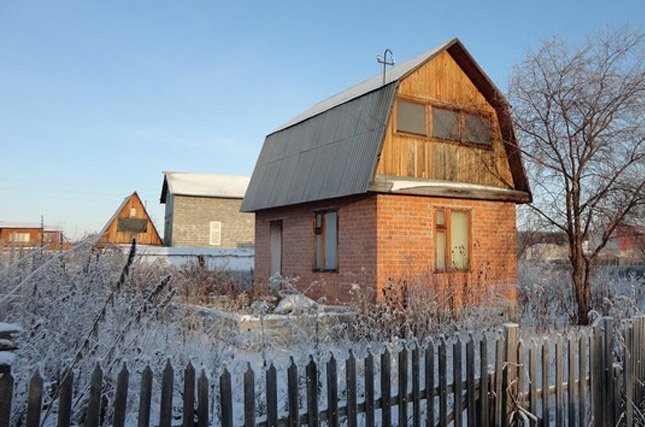 Dachas are small, little countryside homes outside the city. 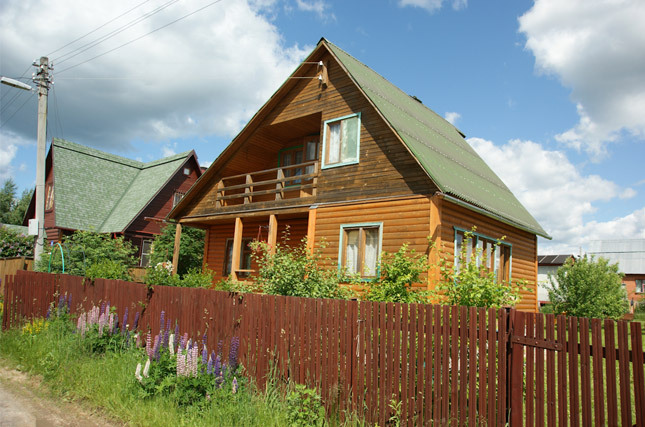 These Dachas are a place to get away, relax, and have some time away from the everyday city noise and pollution. Also known as a vacation home occupied by their owners for part of the year and then rented out to urban residents as summer retreats for the other part of the year. Most Dacha areas exist since the Soviet era. They consist of large amounts of typical, small 600 square meter land plots and were originally built for getaway areas used for gardening and recreation. These plots were extremely popular because Soviet people didn’t have much opportunity to buy land and build their houses where they wanted and had lack of other opportunities to spend their time and money. Because Dachas were considered to be a “second home”, there were restrictions on size and space on these structures. They were only allowed to be one story tall and not to have more than 269 square feet of living space. Legal size restrictions were liberalized in the late 1980s, so housed built after this time period were fairly lager in size. Now you will find that new Dacha areas became fields of fairly large houses on tiny land plots. Between 1963 and 1985 these limitations were very strict and didn’t even allow permanent heating. Now, since 1990 all these limitations have been eliminated. During the “Age of Enlightenment” Dachas were used for social and cultural gatherings, like masquerade balls and firework displays. Then the Industrial revolution brought rapid growth in the urban population and the population started to increasingly desire a place to escape the city for temporarily. After 1917 most Dachas were nationalized and converted into vacation homes while the better ones were distributed among the prominent functionaries of the communist party and the cultural and scientific elite. After the period of World War II, Squatters began occupying unused plots of land using sheds, huts and other dwelling as Dachas. This was due to people wanting to be closer to nature and also so that they could grow their own fruits and vegetables. As time passed the number of squatters grew dramatically. This was due to the failure of the centrally planned Soviet agriculture to supply enough fresh produce. Eventually the government had no choice but to officially recognize the people’s right to amateur farming. And then in 1958 the right to build a small house on land leased by the government was recognized. By the 1980s Dachas were very popular with almost every family in the country having a Dacha. They enjoyed having a place to spend time in and relax or if they did not own one, they would spend time with family or friends that owned one. 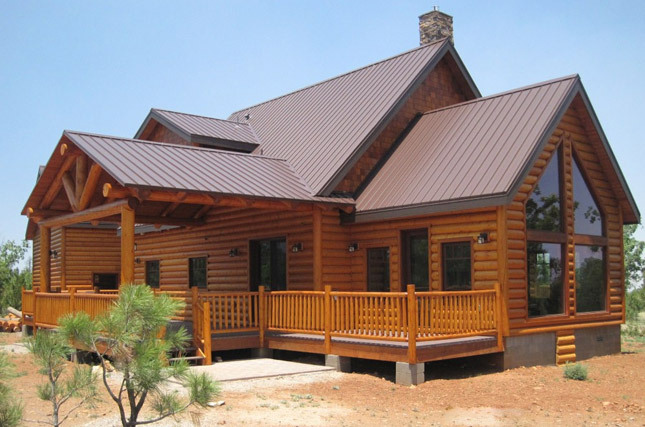 This was an inexpensive way for families to have their own little summer getaways. Having a Dacha also gave families the opportunity to grow their won fruits and vegetables as well. Read also about ukrainian cuisine here.